The Conservative led government of 2010 to 2015 had a terrible macroeconomic record. Partly through their own actions they had presided over the worst recovery from a recession for hundreds of years, and an unprecedented fall in real wages. Employment had increased, but only because productivity had stagnated. Yet the Conservatives were seen by voters as the more competent political party when it came to running the economy, and this probably had a decisive role in winning them the election. This paradox is easily explained. Voters were sold a lie: that Labour through its profligacy had run up budget deficits that had required painful measures to correct, but that recent growth rates showed that these measures had been a success. And the lie worked. I think at least two groups have yet to understand the huge significance of this. The first is the Labour party itself. The reaction of some in the party to this situation is to want to ‘admit’ that they borrowed too much, and try and move on. Yet this seems just like the strategic error they made from 2010 in not trying to challenge the Conservative narrative. Back then they seem to have judged that it was pointless to continue to fight the issues that had dominated the 2010 election, and instead they should ‘move on’. What this strategy did was concede the writing of history to their opponents. Perhaps those that want to fall into the trap of saying that they borrowed too much before the Great Recession think this is no big deal, because if they had known in 2005, say, that a recession was going to come in 2009, they might well have been more fiscally prudent. It should be blindingly obvious that this will not be how any admission is read. Instead the lie that Labour governments are always fiscally profligate will be cemented in stone: their opponents will say that even the party itself now admits it, after years of trying to deny it: how irresponsible is that! The second group that has yet to comprehend the significance of the success of Conservative myth making are the media. Not of course the large part of the media that helped manufacture and promulgate the lie: they fully understand how successful their propaganda has been. The media I am talking about is the part which, to use the BBC’s mission statement, aims to “enrich people's lives with programmes and services that inform, educate and entertain.” When it came to analysing the myth of Labour profligacy and success of austerity, the ‘educate and inform’ part of that mission seems to have failed miserably. Of course this media failure was not just during the few weeks of the election. In the years before, political commentators who have the potential to hold politicians to account allowed coalition ministers to repeat their ‘clearing up the mess’ metaphor without serious challenge. Indeed, to the extent that they continued to challenge Labour on their borrowing record, they became part of the deception. This failure reveals two conceptual flaws in the media’s approach to macroeconomic issues: one with much wider implications, and one specific to fiscal policy. The first is to assume that there are no objective facts, but simply the claims of political parties. So if Labour chose not to challenge the ‘clearing up the mess’ narrative, it was not the media’s job to do so. Conversely, it was not the media’s business to assess the Labour profligacy myth: if the government put the myth forward, it was the media’s job to continue to challenge Labour on it. This is the ‘views differ on whether Earth is flat’ approach. The second relates to how fiscal policy issues are reported. The government continually drew analogies between government budgets and household budgets: the UK had maxed out its credit card. To the extent that this analogy is used to imply that government deficits have to be reduced immediately come what may, economists know such analogies are false. A media that took its duty to educate and inform seriously would recognise this. What the media appeared to do instead was to accept the line that the deficit had to be reduced as quickly as possible, and obsess about the deficit numbers as if they were as important as data on inflation or unemployment. Let me give examples that illustrate both of these problems. On the day that the Telegraph published a letter from 100 business leaders, the CFM published a survey of macroeconomists which asked a question about whether the austerity policies of the coalition government have had a positive effect on aggregate economic activity. Initially on BBC TV and radio both were covered - they made an obvious pair, as the majority of economists were saying something rather different from these particular business leaders. However by the time it came to the evening news, only the Telegraph’s letter seemed to feature. I would love to hear a justification for that strange decision. Was it because the Conservatives used the letter throughout the day, but Labour failed to use the survey? By any objective criteria the Telegraph letter was less informative: it was from a self-selected group, while the CFM results came from a survey of leading economists. But if the media sees its job not to inform but to simply report what politicians say, the decision made sense. A key difference between the Labour and Conservative plans was the degree of fiscal consolidation over the next few years. The implications for welfare programmes and other government spending were addressed by the media. But that is not macroeconomics. The macroeconomics is that a large fiscal consolidation when interest rates are very low is risky. I cannot remember seeing that argument appearing at all in the media, which given its potential importance is extraordinary. As a result of both failures, people believed that the coalition were more competent at running the economy than Labour would be, and remained largely ignorant of the major risk that electing a Conservative government would involve. That is likely to have been one of the critical factors in deciding the election result. On this issue, therefore, the media failed to educate and inform, and this had a significant - perhaps decisive - impact on the outcome of the election. A more serious failure of the media to fulfil its mission is hard to imagine. Yet I suspect those in the relevant media organisations are not even concerned about this, but even if some of them were they would probably be too timid to raise these issues. So both the Labour party, and the independent media, are failing to address the issues raised by the success of the Conservative’s macroeconomic myths. There is perhaps a third group that also needs to think hard about what this all means. Often when scientists complain about how scientific issues are portrayed (or ignored) in the media and by politicians, we get a lot of stuff about how scientists should be more helpful. But in this election a number of major efforts by academic economists were made to get information out there, in ways that were deliberately designed to be accessible. A number covered macroeconomics, and directly addressed issues about the coalition’s record, competence and future plans (as here or here or here, for example). The information was there, but both the Labour party and the media hardly used it. Economists need to reflect about whether this means what they did was a waste of time. Political scientists need to reflect on what this means for their models of how elections are won and lost. It is important to understand that this deficit obsession is not a worry about the long run sustainability of government finances. We know this for two reasons. First, if it was only a concern about long run sustainability, there would be little need to act on that concern now (when doing so is so costly), rather than waiting a few years for the ZLB problem to be safely behind us. Indeed, governments should be worried that austerity now could actually damage long run sustainability, because of the hysteresis effects examined by DeLong and Summers (pdf, and note that their arguments could equally be applied to the impact of cutting back public investment even if there was no hysteresis). Second, governments seem happy to cut current deficits using measures that actually detract from long run sustainability (because it worsens their intertemporal budget constraint). Privatisation at give-away prices is an obvious example. This political economy point is important, because it means that ideas such as Miles Kimball’s alternative to tax cuts - which is to give everyone a fixed period loan - will not be considered because it still increases the current budget deficit, even though long run sustainability is potentially unaffected. The political economy problem is that governments are obsessed with the deficit over the next few years. From a macroeconomic point of view, there is an obvious way around this deficit obsession, and that is to finance any fiscal stimulus using money rather than debt. In a recession creating money does not create an inflation problem, as we have all seen in the last few years with Quantitative Easing (QE). The problem with this textbook solution (often called money financed fiscal stimulus) is that we have ruled it out by creating independent central banks. Governments cannot create money to finance fiscal stimulus. Central banks are creating money - lots of it - but can only use that to buy assets. Whatever political economy problem independent central banks have helped to solve, they have restricted our policy options in what has turned out to be a very serious way. Helicopter money is the obvious solution to this. But it raises a potential problem. Helicopter money describes a means by which central banks can put money into the system in an effective (reliably demand expanding) way, but that process is not reversible. No one is proposing that a central bank can take money away from every citizen. So what happens, once the recession is over, if the central bank wants to reduce the amount of money in the system? This, as Eric Lonergan and Cecchetti & Schoenholtz explain, is the only reason why the central bank’s balance sheet matters. If it runs out of assets to sell, its ability to take the money out of the system that it put in with its helicopter is reduced. This problem is not new. It has already occurred with potential losses arising from QE. In the UK, the central bank has dealt with that problem by getting the Treasury to cover these losses, if they arise. There are many things that the central bank could do if it ever runs out of assets to sell as a result of implementing helicopter money, but the most straightforward is to generalise this arrangement. Governments should commit to providing central banks with the assets they need to control inflation. Making ‘fiscal backing’ of central banks explicit also indicates a contingent liability for governments. Helicopter money creates a contingent liability, and in doing so worsens the expected value of their long run budgetary position. But as we have seen, this is not the major concern for governments. The UK government did not object to QE because it created a contingent liability for them. All that mattered is that it did not raise projected deficits over the next few years. While Eric Lonergan says central banks need not worry about their balance sheets, Cecchetti & Schoenholtz say that they are right to do so, for political rather than economic reasons. A poor balance sheet, which might make the central bank dependent on the government, compromises its independence. I think this argument is very weak. It imagines that central bank independence is about protecting the public from a government of nightmares that actively wants high inflation. As I argued here, a government that wants high inflation will not let an independent central bank get in its way. It is also ironic that central banks still worry about profligate inflationary governments when our problem is governments that put current fiscal probity above everything else, including the health of the economy. The combination of a government that is obsessed with its current deficit and a central bank that is obsessed with hypothetical future inflation is a dangerous mix. This is absurd of course. We don't take polls to decide scientific merit. Indeed, revolutionary ideas - the ones that take the biggest steps toward Romerian truth - would be the ones that would fail, by this criterion. I can understand that for those who typically work outside the mainstream, and indeed may be known for proposing new and challenging ideas, find this kind of talk threatening. Take it the wrong way, and it sounds like a recipe for conformity and stagnation. I’m sure that is not what Paul intended, and I also think he is making an important point here. I suspect a natural scientist would see (e) and (f) as simple statements of how things are. In my experience natural scientists have a clear idea of what the “clear plurality” is on any particular issue, and are happy to admit it, even if they disagree with that plurality. There is nothing here that says academics cannot challenge the ideas of the “clear plurality”. But why is it important to have an idea of what that plurality is and acknowledge it? I can think of three reasons. First, it presents an honest picture to those learning the discipline. Second, it is very important that policy makers are told which ideas are widely agreed and which are the views of a small minority. That does not stop policy makers going with the minority, but they should know what they are doing (as should voters). The public’s trust in economics might also increase as a result. Third, it helps the unity of the subject, mutual understanding and progress. It becomes clear why those who do not accept the views of the “plurality” disagree, and what they need to do to convince the plurality that they are wrong. Convincing the majority that they are wrong is a strong motivational force for progress. In contrast, working within a small school of outsiders all of whom just know that the plurality is misguided, and as a result never bother to engage or keep up with it, is a recipe for stagnation. Before heterodox economists start hitting the keyboard, that also means that the plurality is open to unconventional ideas and do not just reject them because they are unusual or defy certain generally accepted norms. It is for reasons like this that I have argued that it is wrong to say that macroeconomics is ‘flourishing’ simply because there are lots of different ideas/models out there. If there is no clear way of establishing which of these command general support and which are the insurgents, and what the insurgents need to do to overturn any consensus, then it is not clear how the discipline can progress. So when fiscal stimulus was used in 2009, those economists who opposed it should have said something like: I understand that temporary increases in government spending will raise output for given nominal rates in the dominant New Keynesian model, but I think that analysis is wrong because …. They should not have said, as some did, that fiscal stimulus was old fashioned nonsense. Whether they did this out of ignorance or contempt for the mainstream, it suggested that at least some prominent economists were not following the norms of science. Paul Bernal has a powerful post (HT Chris Dillow) where he says Labour lost the election long before 2015, by pandering towards three big myths: the myth that Labour created a huge deficit which required austerity in the midst of a recession, the myth of the ‘scrounger’, and the myth that Labour made a mistake in allowing excessive immigration. I obviously agree about deficits, I’m appalled at the hostility to welfare recipients stoked by the right wing tabloids and the harm done by inept reform, and I’m dismayed that politicians shy away from putting the positive case for immigration. For that reason I should agree that in England at least one of the three major parties should be standing up against all these myths. The Conservatives and Liberal Democrats helped manufacture the first myth, and the Conservatives contributed to the second and pander to the third (although some of their supporters would not favour costly immigration controls). Labour failed to combat all three. The media have, predictably, reached a consensus about why Labour lost: it was too left wing, it was anti-business, it failed to be aspirational (it wanted to raise some taxes on the rich) blah blah blah. But as Peter Kellner and others have pointed out, there is no clear evidence for these assertions. Instead, they just happen to represent the things that much of the media dislike about Labour’s policies. Watching at least some of Labour’s potential future leaders, who the media as a whole describe as ‘modernisers’, fall in line with the media’s diagnosis makes the Parliamentary Labour Party look pathetic. Perhaps it is? And yet, Peter Kellner also points out that being tough on scroungers and immigration is very popular. And these issues mattered for many voters. In a tweet about Bernal’s post, I asked was it better to lose telling the truth than lose being complicit in a lie? But it would be better still if a political party could tell the truth and win! Yet that seems a hopeless task. Jonathan Portes has championed the evidence on immigration, but as the BBC’s Nick Robinson put it, he would not get elected in any constituency as a result. Perhaps I can also make a very personal point here. As one of only a few academics who have written an academic paper on the Labour government’s fiscal record, which concluded that Labour profligacy was a myth, you might have expected Labour at some stage to have used some of the many words I have written on this to support their case. As far as I know they did not. Perhaps they were put off by some of the my criticism of other aspects of Labour’s programme. But this didn’t put off Alex Salmond, who was happy to quote my support of the SNP’s line on austerity, suggesting it had all the more force because I was not an SNP supporter. Talking of which, I think there is one more piece of received wisdom that needs exposing, and that is Scottish exceptionalism. As I hinted at the beginning, there was one major UK party that did campaign against austerity, was pro-immigration and supportive of welfare. No doubt other factors also led to the huge success of the Scottish national party, but their position on these three issues didn’t seem to do them any harm, and in some cases probably helped a lot. This example suggests the answer to the question posed in the title is a clear no. It is generally presumed by the media, both sides of the border, that this is all because Scots are inherently more left wing than the English. But the evidence suggests differences in social attitudes between Scotland and England is not that great. The question Labour (or at least somebody) should be asking is why the SNP can avoid pandering to these three myths and win decisively, when the consensus is that doing the same in England would be electoral suicide. Some people who comment on this blog say that when I voice concerns like this I’m being a bit passé, but on other occasions I’m accused of being anti-democratic! Somehow a politician choosing to delegate macro policy to experts reduces democracy, but allowing rich media barons to control the information that much of the electorate receives, and as a result have a considerable influence on politicians, is just fine. Not now exactly. In the UK, for example, the MPC has scope for some further reduction in interest rates. (I think they should use that scope now, but that is for another day.) But, as Mark Blyth, Eric Lonergan and I argue in the Guardian, if something serious goes wrong in the next year or two, or if another financial crisis happens in the next decade or two, monetary policy is under equipped. Does this mean that I no longer think it is a good idea to have a fiscal stimulus in a recession when nominal interest rates are at their floor? Of course not, because helicopter money is essentially just like a tax cut. What is true is that helicopter money is not my ideal form of fiscal stimulus, partly because there is some uncertainty about how much of it will be spent. I would much prefer additional public investment, for which there is a strong microeconomic as well as macroeconomic case. Michael Spence  is one of a huge list of eminent economists, which includes Ken Rogoff, who think additional public investment across the OECD would be beneficial. We should continue to urge governments to recognise this, but we also have to accept the awkward fact that they are not listening. In political terms, the need to reduce deficits trumps pretty well anything else. (Perhaps things are turning in the US, but until the Republicans start losing power I’m not counting chickens.) One of the many depressing things about the Conservative election victory in the UK is that it looks like deficit obsession is an economic strategy that can win, as long as the austerity is front loaded, which is why Osborne fully intends to do it all over again. Because helicopter money is mainly a form of fiscal stimulus, and because the case for fiscal stimulus in a liquidity trap is largely agreed by most academic macroeconomists, the debate over helicopter money is essentially an issue in political economy. Persistent demand deficiency is clearly preventable, and represents a huge economic cost to society. Politicians will not do what economists call a bond financed fiscal stimulus because spreading scare stories about public debt is a vote winner. That leaves us with a money financed fiscal stimulus, of which helicopter money is one form. With independent central banks, that means giving these banks the power to undertake helicopter money. I think the biggest obstacle to helicopter money is probably central banks themselves. This is for two reasons. First, they seem far too optimistic about the efficacy of creating money to buy financial assets (QE), even though they almost certainly need to create far more money by this route than they would through helicopter money, with a far less certain impact. Second, there is this residual worry that creating money now will mean they will lose the ability to control inflation in the future, as if a modern government in an advanced democracy would ever refuse to provide them with the assets they need. The consensus among macroeconomists is that independent central banks are a good idea. The belief is that the business of macroeconomic stabilisation is best achieved if the task is delegated. But making central banks independent is not the same as completely delegating the task of macroeconomic stabilisation, because of the problem of the lower bound for nominal interest rates. Indeed independent central banks made the obvious way of getting around the lower bound problem, which is a money financed fiscal expansion, more difficult to achieve. Helicopter money is a way of making the delegation of stabilisation policy complete. I have suggested how (see here and here and here) we could have ‘democratic helicopter money’ that could encompass additional public investment, but I’ll happily settle for the plain vanilla kind for the moment. Rather than get into the pointless business of comparing quotes, let us do this the academic way, which is to see what the Keynesian model says. Recall this is the model that pretty well all central banks use to regulate the economy. Everyone agrees that UK austerity was at its most intense in the first two years of Osborne’s Chancellorship. The UK Office of Budget Responsibility, which does the number crunching for Osborne, calculates using standard (although conservative in the current context) Keynesian multipliers that austerity in those first two years reduced GDP growth by 1% in each year. That is the basis for my calculation that austerity cost the average UK household at least the equivalent of £4,000. The OBR also calculate that overall UK austerity had no significant impact on growth in subsequent years. Does the data show that Keynesian assessment is clearly wrong? Ferguson includes an IMF chart in his article, and I commend the fact that it uses GDP per head. Unfortunately it also includes a forecast, which is as reliable as most macro forecasts, so just focus on the part that is data. In 2011 and 2012 the UK flat lined, and only started recovering when the drag imposed by austerity came to an end. This is entirely consistent with my and the OBR’s analysis. (For the record, I also said three years ago that we would see a recovery in subsequent years.) Anti-Keynesians like to point to UK growth from 2013 onwards being healthy compared to other countries, but this is also entirely consistent with Keynesian analysis, because if you look at underlying primary balances UK fiscal austerity was much weaker in those years than in the US or the Eurozone. In a way Ferguson acknowledges all this, because he lists other potential reasons why UK growth might have been weak in those early years. Fair enough, except that his central claim is that the numbers show the Keynesian analysis of austerity is wrong. But his chart shows that the numbers are in fact completely consistent with the Keynesian story. That does not prove the Keynesian story is right, but it sure does not show it is wrong! Macroeconomics is a messy subject, because there are always so many things going on. For this reason the impact of policy is often not immediately apparent in the data, and some econometrics is required to sort things out. The unusual feature of the last few years across the UK and Eurozone is that events have largely followed the Keynesian script - no econometrics required. An election result does not change this fact. This is something of a personal indulgence, but my excuse is obvious given recent posts. “Good spin is simple, and plays off real events. So the line “we have to reduce debt quickly because otherwise we will be like Greece, or Spain” works, while the response “but the Eurozone is special because member countries do not have their own central bank” is too technical to be an effective counter. In contrast the argument that Wolf and Portes put forward above – why not invest when it’s so cheap to borrow – is effective, which is why it is dangerous. So of course is “austerity is stifling growth”, as long as growth is negative or negligible. However, come 2015, the spin “we have done the hard work and the strategy has worked” will accord with (relatively) strong growth, while talk of output gaps and lost capacity will have less resonance. True, unemployment will still be high, but not many of the unemployed are Conservative voters, and the immunising spin about lack of willingness to work can be quite effective. I got two things wrong here. First, I did not foresee the continuing stagnation in productivity, and therefore that unemployment would fall rapidly despite at best average output growth. (Perhaps another piece of Cameron ‘luck’?) Second, I got the example of a budget stimulus measure wrong (we in fact got Help to Buy), because I was thinking like an economist and not a certain politician. But one thing I did not get wrong is that there would be a recovery. Indeed I was if anything expecting a rather stronger recovery than actually took place. The reason I got this right, and the second reason I smile, is that this has nothing to do with any personal insight on my part. As Paul Krugman explains, I was just using the standard Keynesian model. What amuses me is how some anti-Keynesians seem to think that Keynesian ideas are embodied in the words of certain well known Keynesians, rather than in the journals, textbooks and central bank models. As Paul has rightly said many times, the basic ideas of Keynesian economics have been pretty well vindicated by macroeconomic developments in recent years. This, you might argue, is why they are in the textbooks and central bank models in the first place. She goes on to say that it is macroeconomists’ “certainty that’s astonishing”. Her comments could be summarised as asking why macroeconomists are so sure and shrill compared to their micro colleagues. Now it could be that there is something odd about those who choose macro rather than other types of economics, but I’m not sure I’ve noticed any character traits more evident in macro people. (But who am I to judge - an open invitation for microeconomists to comment!?) It could be something to do with the nature of the theory and empirics involved, but since macro became microfounded that seems unlikely. I think the problem is in a way much more straightforward. I think you only need to look at the recent UK election to understand the problem. One of the central themes of the Conservative’s attack on Labour involved their alleged incompetence at running the macroeconomy when they were in power. For whatever reason, macro rather than micro policy issues become central in political debates. That makes macro unusual for various reasons. One immediate consequence is that many beyond the tribe of macroeconomists think they can write with authority of macroeconomic issues. As a recent example of a shrill macro debate Diane cites Krugman vs Ferguson. But this is not to compare like with like. On one side you have an economics Nobel Prize winner who has made important contributions to macroeconomics, and as a result is careful about what he writes. Both data and theory are respected. On the other side … well I’ve said what I think in an earlier post. To take another politically charged topic, I have seen plenty of debates between climate change scientists and deniers who are not scientists. Often the scientist will go into detail to get the facts straight, and say how uncertain everything is, while their opponent by contrast will be confident and clear. A scientist will not be fooled by this confidence, but many others will be. When one side argues out of conviction or ideology or political bias rather than knowledge, it is difficult for someone who does have that knowledge not to respond in kind if they want to be convincing. There is a deeper reason for shrillness, however. The debate over austerity is not a normal academic discussion about the likely size of parameter values. Here Diane is mistaken in saying that the key issue is whether the multiplier (the size of the impact of cuts in government spending on output) is greater or less than one. In talking about UK austerity, I have typically quoted OBR figures which assume a multiplier below one, which gives me the £4000 per average household cost of UK austerity. My own best guess would be that the multiplier has been larger than one, which gives me significantly higher costs, but I have never suggested that I know with certainty what the size of the multiplier has actually been. However there has, to my knowledge, been no public debate on these terms. Instead supporters of austerity typically want to suggest that the multiplier is close to zero. They want to suggest that sacking nurses and cutting back on flood defences will be very rapidly met by an increase in private sector labour demand and investment. Although theoretically possible via various different mechanisms, the evidence and recent experience overwhelmingly suggests this does not normally happen in the kind of situation we are currently in. For much of the time those arguing for the virtues of current austerity seem to be doing so from a position of faith or political convenience rather than evidence. Why is it important to recognise this? Because there is a danger that microeconomists may misdiagnose the problem, and suggest that macro contains some fundamental flaw which undermines eighty years of intellectual endeavour. This provides useful cover to those who have an ideological or political agenda, and want policymakers to ignore the bits of the discipline that clearly work. Sometimes microeconomists seem to think that if only they could disassociate themselves from macro, economics would become a better and more respectable subject. That is an illusion: the ideological and political forces that cause such problems for macro are not unique to it. So I’m not sure that academic macroeconomists suffer from an excess of certainty compared to their micro colleagues. Instead I think the trouble with macro is that it is prone to ideological and political influence: like all economics, but just more so. In response to this post, David Smith of the Times tries a bit of gotcha journalism. Chris Giles tweets “A justly irritated @dsmitheconomics reminds @sjwrenlewis of some of stuff he has written and forgotten”. Only one problem: it is nonsense, and slightly embarrassing nonsense at that. The facts are not really in dispute. A number of economists have drawn attention to the fact that the original austerity plan to eliminate the (cyclically adjusted) current deficit by 2015-16 was changed in 2012. David Smith wants to argue, as the government does, that “the government has stuck pretty much to its consolidation plan”. Call this claim X. What economists argue from the data could be described as not-X. In my post I argued that claim Z was a straw man. I had not seen anyone make claim Z. David responds first by quoting a Guardian leader that uses the word abandoned in an unqualified way, and I must admit I do not read Guardian leaders. But he then provides two quotes from Paul Krugman and two from myself where we say austerity in 2012 was ‘put on hold’, that the government ‘essentially stopped tightening fiscal policy before the upturn’, or that austerity was ‘temporarily abandoned’. This is quite different from claim Z, involving complete abandonment. So they are hardly support for his straw man. It is also pretty clear David knows this. He writes “I am not sure when the suspension or (temporary) abandonment of austerity Simon refers to is supposed to have come to an end.” That is cover to translate what I wrote into claim Z. But just a few sentences down from the first of his quotes from me I write: “followed by a projected return to austerity from 2014 onwards”. Whoops. If all this seems a bit silly to you (as it does to me), you need to understand the bigger picture. Why is David (alongside others) so keen to argue that the government stuck to its consolidation plan, when the data clearly suggest otherwise? Well I think I know why the government wants to pretend that there was no change of plan in 2012. Because the moment you admit that the pace of deficit reduction was slowed (by action or inaction), people will ask why, and the obvious answer was that the original plans were hurting the economy and delaying the recovery. Most economists and the OBR know this, but the government has tried very hard to make sure that knowledge is not disseminated more widely. A few people have asked me to respond to this FT piece from Niall Ferguson. I was reluctant to, because it is really just a bit of triumphalist Tory tosh. That such things get published in the Financial Times is unfortunate but I’m afraid not surprising in this case. However I want to write later about something else that made reference to it, so saying a few things here first might be useful. The most important point concerns style. This is not the kind of thing an academic should want to write. It makes no attempt to be true to evidence, and just cherry picks numbers to support its argument. I know a small number of academics think they can drop their normal standards when it comes to writing political propaganda, but I think they are wrong to do so. Take this paragraph, designed to show how good UK macro performance has been compared to the dire warnings of those Keynesians. The first sentence is correct. But why compare that to 2009, which apart from being the ‘last full year of Labour government’ also happened to be the year of the recession that followed the global financial crisis. As I have mentioned before, growth in GDP per head under Labour averaged 1.5% even though it included this recession, but average growth from 2010 to 2014 was only 1% when we should have been seeing a rapid recovery. 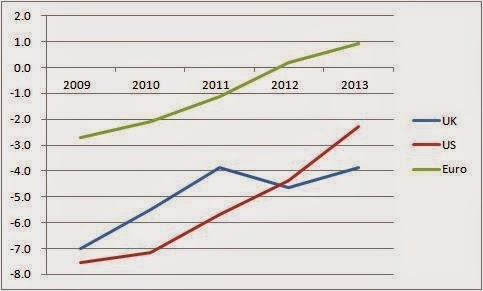 The jobs figures are mentioned, but the awful productivity performance that they imply is not. Earnings growth over the whole period is quoted (but without saying it is nominal growth), but only inflation over the last year! Presumably this is done to create the impression of real wage growth, when in reality this period has seen unprecedented falls in real wages. It is possible for someone to try and make a serious academic case in defence of the coalition government’s macroeconomic record, but this is not it. This kind of nonsense polemic is of course not just the preserve of the anti-Keynesian right. But what this kind of thing does illustrate is how problematic public debate on macroeconomic policy is. It is difficult to think about many other academic subjects where people who seem to have little idea of what they are talking about can write such obvious rubbish in a quality newspaper. Paul Romer’s post also links to the idea in this paper by Paul Pfleiderer about theoretical models becoming “chameleons”. To quote: “A model becomes a chameleon when it is built on assumptions with dubious connections to the real world but nevertheless has conclusions that are uncritically (or not critically enough) applied to understanding our economy.” I think we could add that these conclusions are usually associated with defending a particular political view or sectional interest. It is important to stress that this is not an attack on the microfoundations methodology, just as Paul Romer’s article is not an attack on mathematical modelling. Most DSGE modellers, who are not subject to any political aversion to using price rigidity, happily use this methodology to advance the discipline. But if that methodology is taken too seriously (by what I call here microfoundations purists), so that modellers only look at what they can microfound rather than what they actually see in the real world, it can allow approaches that should have been discarded to live on, perhaps because they support a particular policy position. A discipline where a huge number of alternative models persist could be described as ‘flourishing’, but risks disintegrating into alternative schools of thought, where some schools have an immunisation strategy that protects them from particular kinds of empirical evidence. As Paul perceptively points out, this makes economics more like political discourse than a scientific discipline. Some people welcome that, or regard it is inevitable - I hope most economists do not. This means we first need to collectively recognise the problem, rather than keeping our heads down to avoid upsetting others. I hope Paul Romer’s article can be part of that process. This may also be the first in a series! Chris Giles of the FT tweeted: “The shocking thing about this excellent post is the misinformation that forced @dsmitheconomics to write it”. Now the reference to myths might make you think David Smith is having a go at yours truly, but I would never be so narcissistic. I know this cannot be the case because I have never said that austerity was abandoned in 2012. In fact I cannot think of anyone who did, but clearly I’m not reading the right people. Of course this could be another example of the straw man trick: to defend position X (plan A continued) against position Y (the pace of austerity slowed), create a third position Z (austerity abandoned) which is a silly exaggeration of Y, and show that Z is false. Ergo X must be true. Remember how critics of austerity had to be wrong because they claimed a recovery would never happen. What David concludes, of course, is that the pace of austerity slowed from 2012 onwards, which is obvious if you just look at the data. So why does he think this is such a problem for critics of austerity? Again we need a straw man: someone who “see[s] everything that has happened to the economy through the lens of fiscal policy.” Now I’m sure I have never met anyone like that, but if such a person existed then the 2013 recovery would be inexplicable, because austerity was continuing (albeit more slowly). This is terrible stuff. Every macroeconomist besides those of David Smith’s imagination knows that the economy is influenced by all kinds of factors, or which fiscal policy is but one. So a recovery is perfectly compatible with austerity being a drag on growth, particularly if monetary policy is highly expansionary. One way of thinking about the impact of a fiscal contraction is that it has its maximum impact on the level of GDP when it happens, but this impact dies away as other forces, like monetary policy, bring GDP back to its ‘natural’ level. Whether that is the right way to model the impact of fiscal policy in a liquidity trap is debatable, but that is how the OBR treats the impact of fiscal policy, and from his post I’m glad to see that David thinks the OBR is an authority on these matters. Here is a chart from this OBR document. The orange bars show the impact the original 2010 plan would have had, and the blue bars what actually happened (and what will happen) as seen in March 2014. The blue bars are the basis for my conservative estimate that austerity cost every UK household on average £4000 worth of resources. Even though in both cases austerity continues through 2012 and 2013, the impact on growth dies away (or even becomes positive), because the negative effect of any new austerity is offset by the impact of earlier austerity dying away. It really is very simple. George Osborne campaigned in 2010 that Labour’s plan to cut the deficit by half in five years was much too slow, and so began a much tougher austerity programme. More rapid deficit reduction was at the centre of that plan. But deficit reduction was allowed to slow from 2012. Why did the media not challenge Osborne on why this was happening? Why did it go along with the fiction that the plan was unchanged? The media has no problem asking Labour politicians to account for why they borrowed too much (allegedly), but when George Osborne borrows much more than he planned, having previously stressed the importance of cutting the deficit quickly, this suddenly becomes unimportant. Strange that. Why are some central banks so coy about the impact of fiscal policy? The report does not even say the obvious, which is that fiscal policy will therefore act as a significant drag on growth over the next few years. How much of a drag? 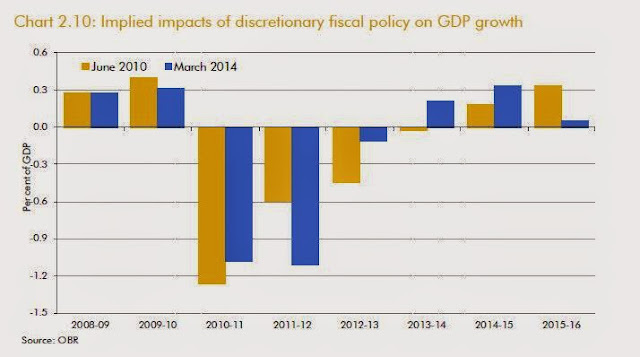 The OBR estimate that past fiscal consolidation has reduced GDP by around 2%. We could therefore infer from this paragraph that future consolidation will tend to reduce future GDP by a similar amount. But this assumes that the Bank agrees with the OBR’s assessment about the past, and the Bank says nothing on this. There is a lot more that could be said. If fiscal consolidation comes in the form of cuts to welfare rather than government spending on goods and services, will this make a difference to the demand impact? If, given the promises made during the election campaign, some of this deficit reduction does not take place, how much earlier would we expect interest rates to rise? These are at least as important as the other issues considered at length in the report. So why the silence on the impact of fiscal policy? I guess it is deemed politically sensitive to talk about such things. But silence is not a neutral position in the current political context. Silence suggests that the demand impact of fiscal policy is somehow unimportant, or perhaps particularly uncertain: both of which the Bank knows are untrue. This is not about monetary policy makers trying to avoid treading on the toes of fiscal policy makers. It is about monetary policy makers supporting a political position which chooses to be economical with the truth about the impact of fiscal policy. The Bank being coy is the Bank colluding with those who are being economical with the truth. I took a short break after the election, so I managed to avoid most of the immediate post-election analysis. But I could not avoid seeing some Labour people complaining about how Labour’s defeat was because they vacated the centre ground and went for a core vote strategy. This seems very odd. In terms of ‘vacating the centre ground’, I thought it was pretty obvious that occupying it was the main Liberal Democrat strategy, and that didn’t go too well. In terms of a core vote strategy, it seems to me this applied at least as much to the Conservative campaign. Rather than Labour and Liberal Democrat people asking what they did wrong, they should ask what the Conservatives did right. What they did right had very little to do with actual Conservative policies, beyond fiscal sweeteners mainly directed to their core voters. Instead it was about attacking their opponents in areas where - for whatever reason - their opponents failed to fight back. In terms of Labour, the Conservative campaign mainly focused on three themes: how inadequate Ed Miliband would be as Prime Minister, how bad Labour’s macroeconomic policies had been when they were last in government, and how Labour would be ‘held to ransom’ by the SNP. With all three of these, the arguments were not based on clear objective facts, but on political spin. As Peter Oborne has observed, Miliband’s performance as Labour leader had indicated a number of positive qualities which suggest he could also have been a good Prime Minister. However he is no Cameron or Blair, and the Conservative machine managed to spin this unfamiliarity as a weakness. A minority Labour government backed by the SNP would have been unusual, but would it really have been so much more unstable as this government will be given how split it is on the EU? This question was never asked in the popular debate, which instead managed to galvanise English nationalism against an imagined threat from north of the border. The Labour line that there would be no deals was inherently defensive, as well as being unconvincing. The distortion on economic policy was perhaps the greatest of the three pieces of spin. In a post written before the election entitled ‘UK election: it was mediamacro wot won it’ I ended with the following line: “if the coalition government remains in power after this election (or if the Conservatives win outright), then the title of this post will have rather more justification than the Sun’s original headline.” Harvard historians writing macroeconomic nonsense in Financial Times op-eds after the election shows that the mediamacro problem is not about to disappear. What the Conservatives achieved was to turn at best half-truths into apparent facts, which then became the talking points of the media’s coverage of the campaign. The Conservatives won because their spin was so much better than their opponents. That is the lesson of the 2015 election, and not anything to do with actual policies. To many Labour or Liberal Democrats supporters, this argument will be very unpalatable. They hate the idea of political spin, and all it represents. I have a lot of sympathy with that view, but I suspect it may help lose elections. In fact, it is probably much more important for the centre and left to think a great deal about political spin, because they have to overcome the spin machine that is much of the UK press, as well as the specific problems associated with mediamacro. Left leaning think tanks prefer to focus on policies rather than propaganda, a characteristic less evident in their right leaning counterparts, but in terms of winning an election that is a weakness. A few of the post-mortems on Labour’s defeat that I have read suggested they should have tried to counter the myth of Labour profligacy much earlier than 2015. Having written for some time about this myth, I could hardly disagree. I suspect within the Labour hierarchy the view was to look forward rather than go over the past, but you cannot abandon the writing of history to your opponents. However that was not just one mistake among many successes: instead Labour's political spin appeared to be consistently amateur compared to their opponents. While over the next few months the debate will be about selecting a new leader who can recapture some of the Blair magic, the truth may be that the more important task is to employ a lot more people like Alastair Campbell.